An extensive waterway system meanders through the Gardens and feeds seven water gardens. Together, they display more than 450 aquatic plant species and varieties. 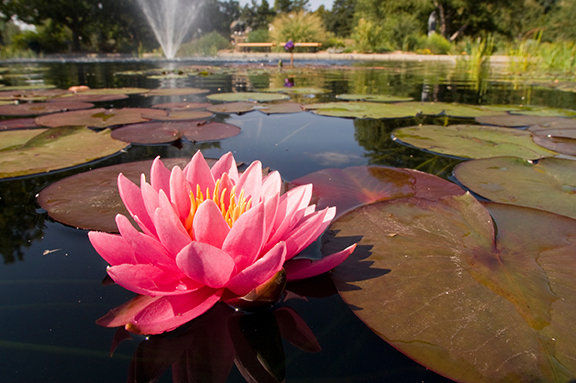 The Gardens is a world leader in aquatic gardening and the display of aquatic plants. This pond adjacent to the Science Pyramid displays a changing array of aquatic plants. 2017 brings a mix of aquatic plants including marginals, hardy and tropical waterlilies. The tower fountains in this pool are the entry point for water recirculated throughout all of our waterways running west to the Gates Montane pond. 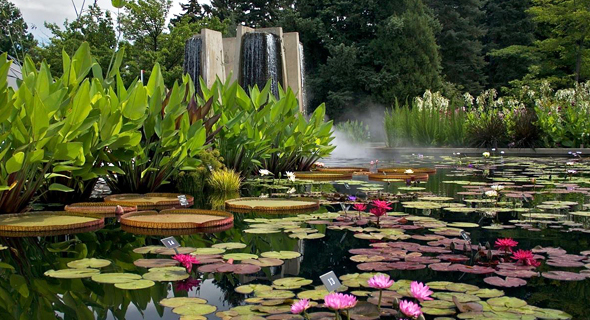 The Monet Pool is our largest water garden and features a stunning collection of aquatic plants, including hardy and tropical waterlilies, Victoria waterlilies, cattails, pickerel plants, cannas, iris, and more. Peak bloom occurs from June through September each year. An annual Water Blossom Festival is held in early August.